Giveaway: That Stinks! 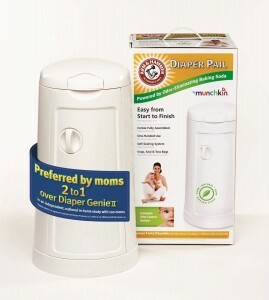 Arm and Hammer Diaper Pail by Munchkin | Breezy Mama Breezy Mama - Expert parenting advice, celebrity interviews, product reviews for kids, moms and babies and more! Munchkin is unveiling their new Arm & Hammer Diaper Pail, and to celebrate it’s debut, they are hosting a giveaway. Basically, Munchkin knows that life can stink–but they want you to know that the new Arm & Hammer Diaper Pail by Munchkin doesn’t. To enter to win a diaper pail, you need to go to Munchkin’s Facebook page and post your story of what stunk–and it doesn’t have to be in the literal sense. For example, were you running late to preschool drop off, finally getting everyone in the car, when your newborn has a blow-out? Or, did you FINALLY crawl your way in to Starbucks only to have left your coffee on the roof of your car? Or, did you get your dog washed–and minutes later she was rolling in the mud? All of these stories stink–now let Munchkin know. 1) Go to Munchkin’s Facebook page and post your That Stinks! story. Click here to do that. 3) The contest runs until November 15, 2010. When it’s over, we’ll pick the top winners, and the diaper pail will be sent out to you. Good luck, can’t wait to read everyone’s funny stories! I know who needs this!! I’d love to win this for my SIL. She is expecting her first child in February.